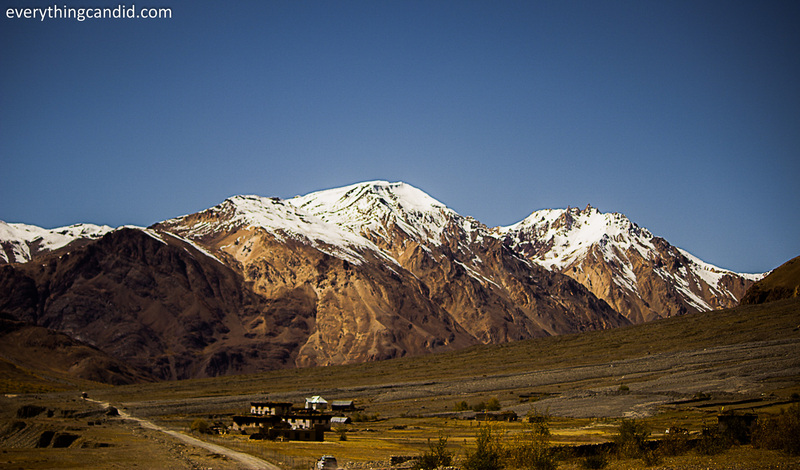 Kunzum Top: A confluence of Hinduism and Buddhism! 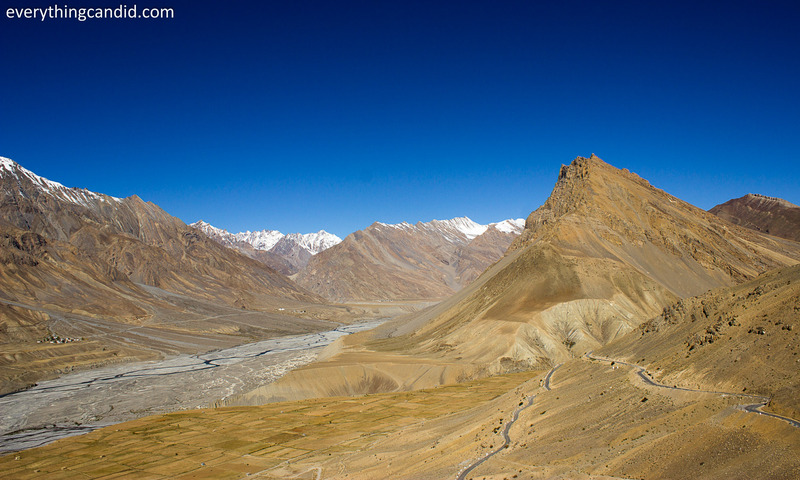 One has to pass many ordeals from either side to reach this place but at the end each ordeal pays heavy dividend in the form of pristine beauty on either side of this Pass. 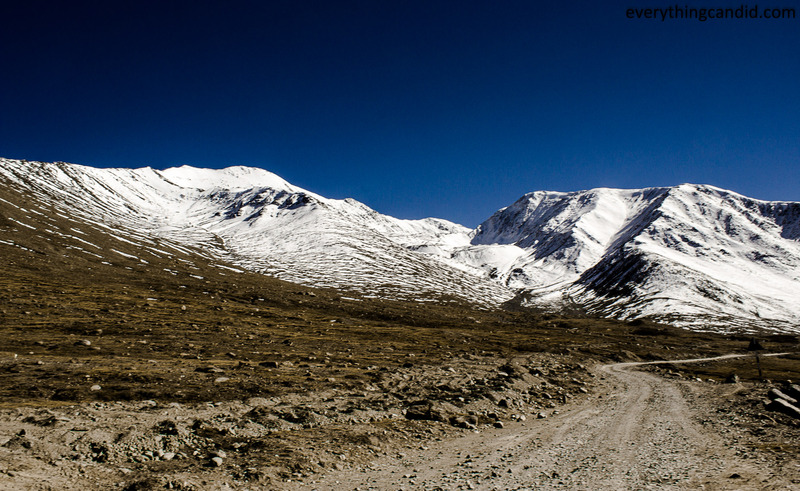 Kunzum Top has a definitive allure which pull you towards it which I never felt anywhere ever. 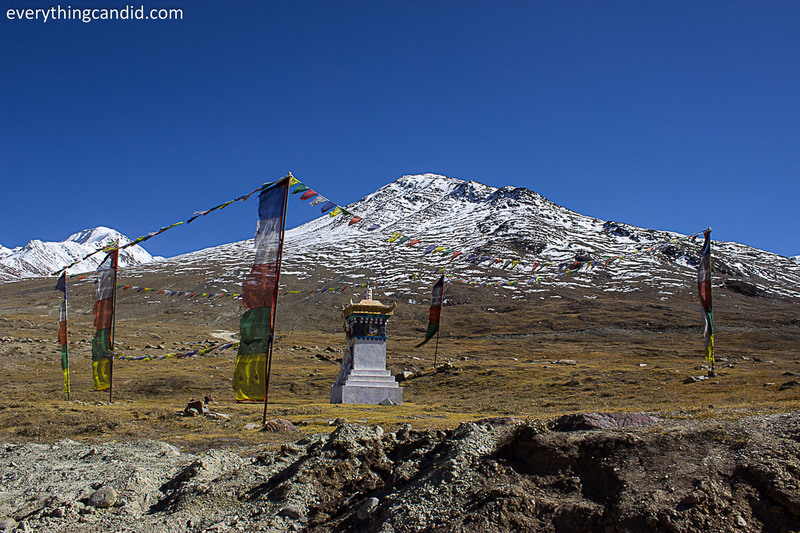 Goddess Kunzum is the residing deity and keeps guard over this pass. 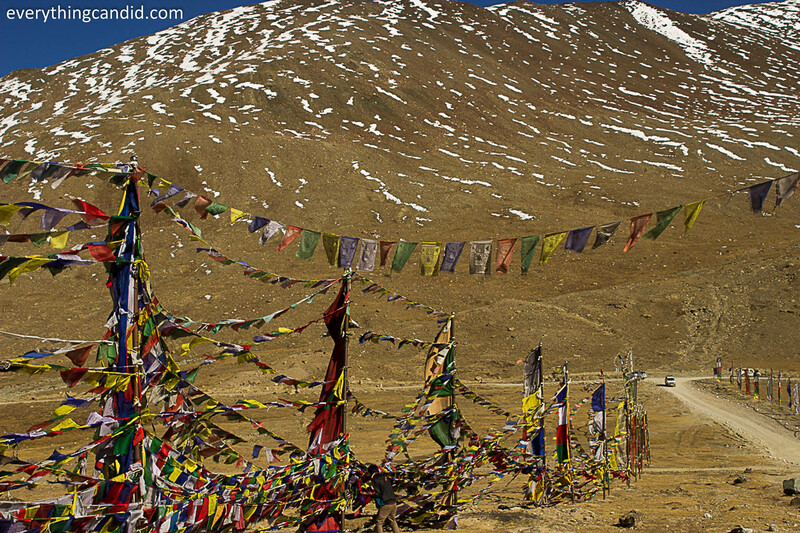 Every passerby has high reverence towards her and without paying due obeisance no one passes from here as they believe Goddess Kunzum wards off all the evil and peril of this treacherous road. 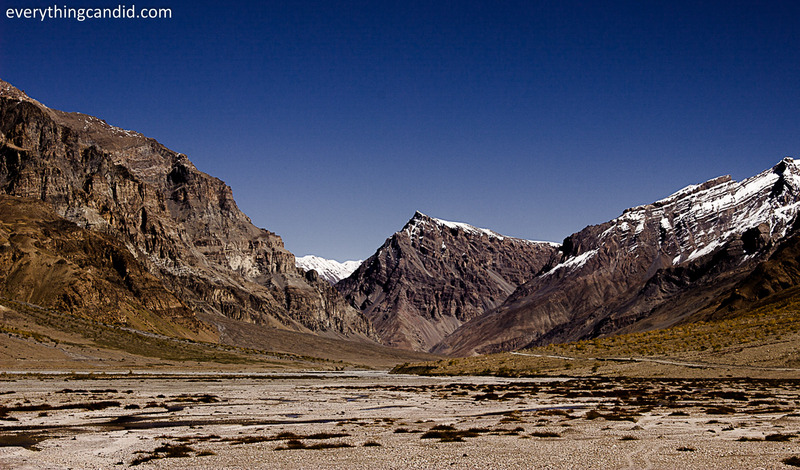 To witness the might and the beauty of Kunzum Range we started our road trip from Kaza side and it was a 70 KM journey along River Spiti – a last leg of extreme adventure high adrenaline filled with all adjectives one can think of for a road trip..It was offbeat, off-track, adventurous, Self-elevating, risky, scary, heavenly etc etc. 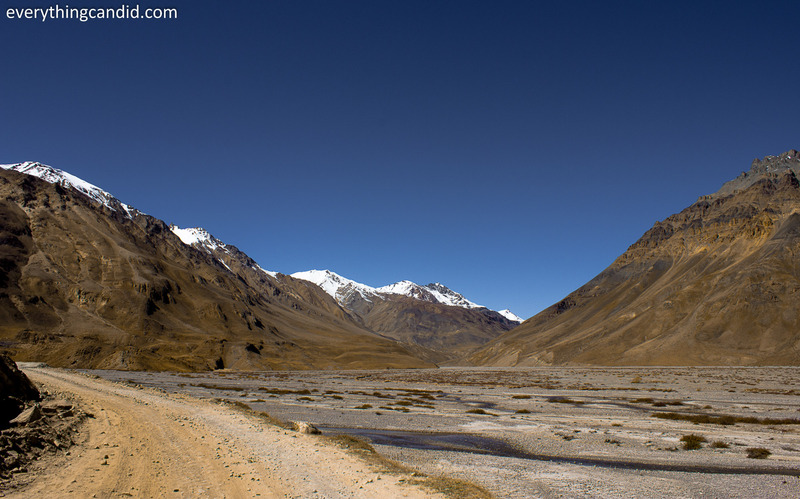 Each turn of the road from Kaza to Kunzum brings another breathtaking awe and thus we stopped every mile to capture the expanse of visual scenery spread in all directions. 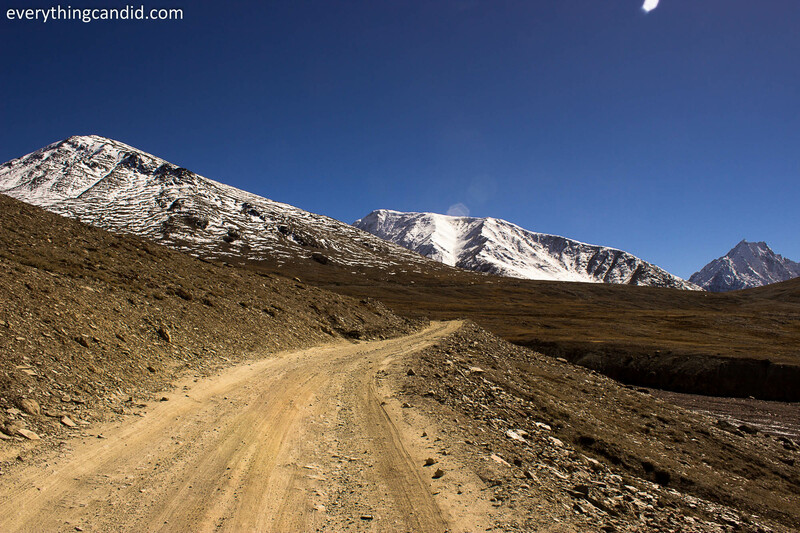 Road to Heaven called Kunzum! 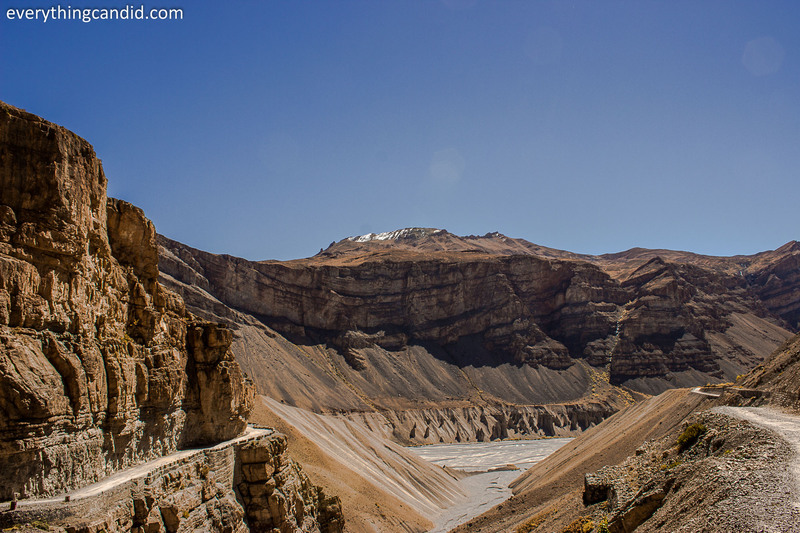 On this road while driving up steep incline, I started to believe that God of Landscaping must have started to paint the Canvas of Spiti Valley while sitting at Kunzum Top overlooking entire Spiti Valley and certainly Spiti is his most beautiful art form. 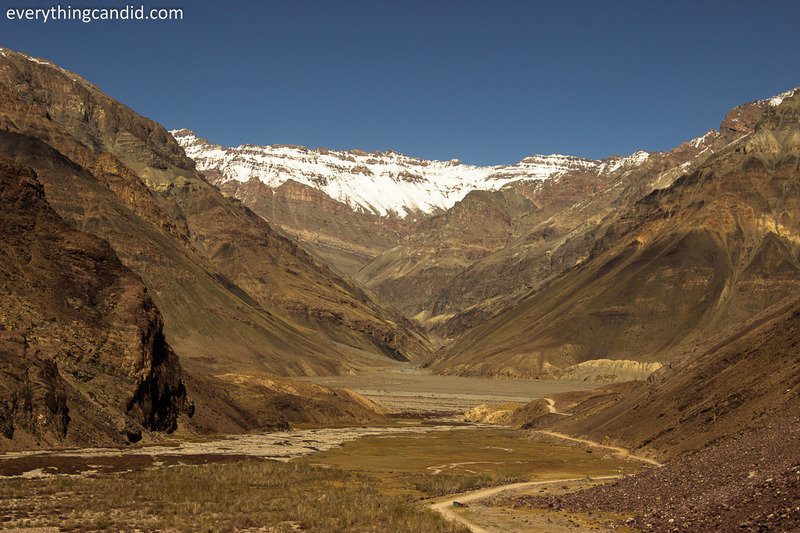 With best of all his skills and knowledge he colored every inch of Spiti Valley and then he created the Kunzum Pass to guard his pristine beauty from the outside world. God of Landscaping inspired by God of Sculpture. 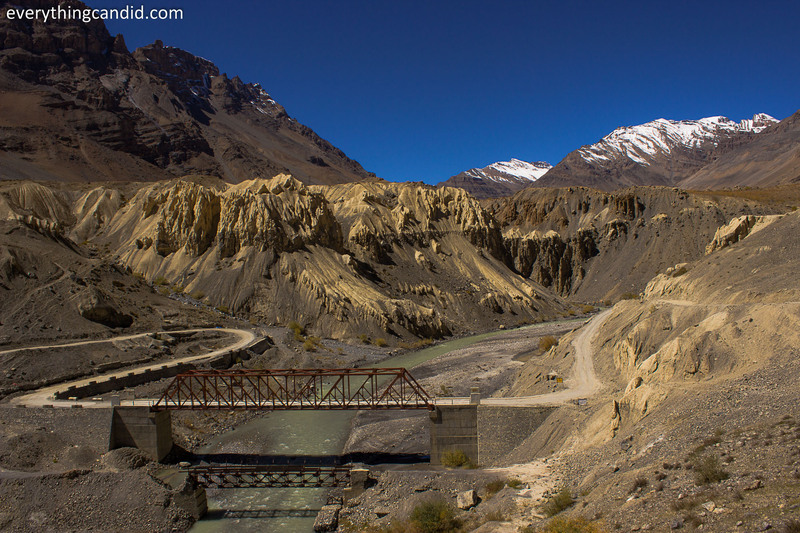 Spiti River: A constant Companioin! After crossing sparsely populated hamlets such as Rangrik, Murang, Hull, Kyata, Losar and enjoying all around amusement recreated by nature we reached Kunzum in 4 Hours. 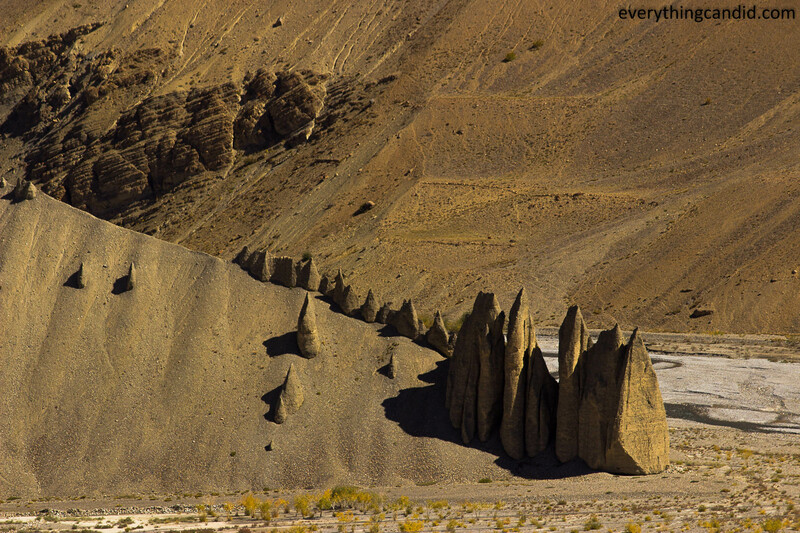 A series of Chortens decorated with Buddhist Prayer Flags welcome us, however, I got the overwhelming kick by standing next to the Sign Board confirming our arrival to Kuzum Top. Another landmark achieved and it was invaluable. 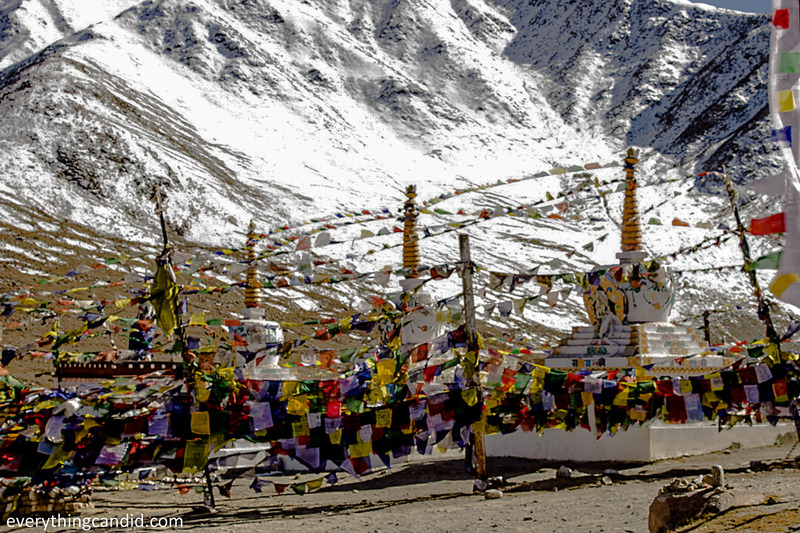 The entire set-up is a symbol of mutual respect people of this region have for Hinduism and Buddhism as Chorten with Prayer flags resemble Buddhism but the Goddess inside the Chorten is Hindu Goddess Durga revered at Goddess Kunzum here. A gravel road off-shootong from main road encircles this Hindu Temple before merging with Main road. Local people and truckers revere this as path of good luck and insist on everyone to circumambulate the temple before going further, so we also took this path to keep lady luck on our side. Another ritual to follow here is to stick a metal coin on a statue inside the temple through the window. Success in doing so confirms you as a person with good karma and failure ask you to keep trying. I was the third person of the day who could successfully stick the coin. Woohooo.. 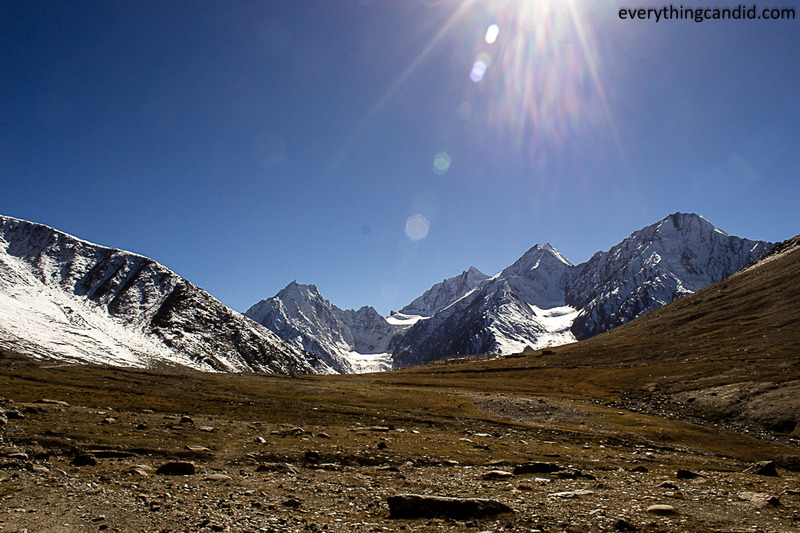 The Kunzum Pass or Kunzum La! We together at the top of the world! Further, we spend 10 minutes on this pass and I could sense over joyous calm seeping deep inside my mind and filling my soul with blissful elation. 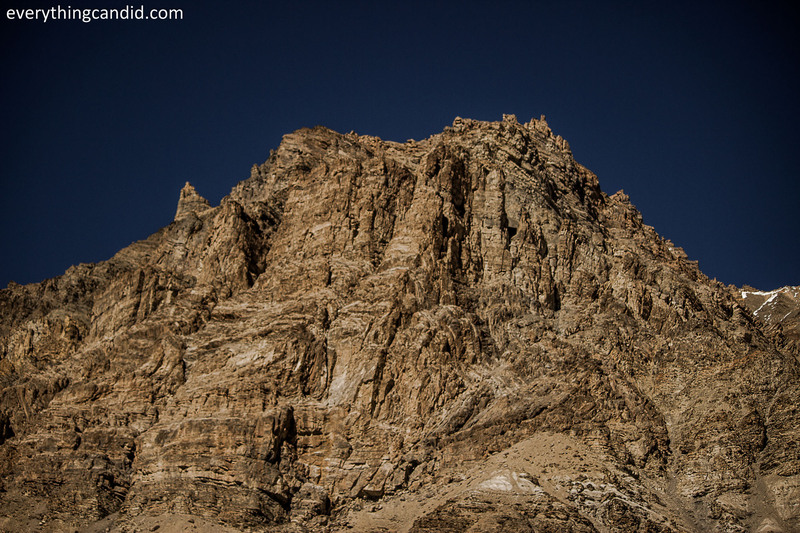 This in all senses was a self-elevating experience which I never felt earlier and more so because I reached the top of the world on my hatchback and this realization doubled up the joy. 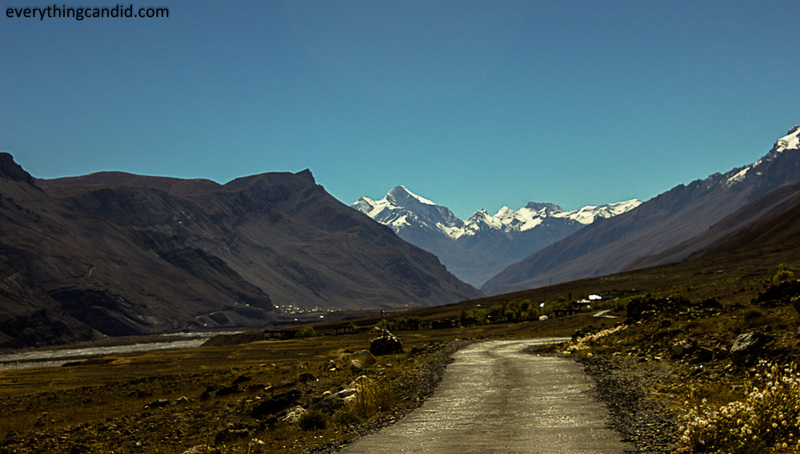 But the grand presence of the Himalaya amidst the vastness of nothing all around made me feel humbled and I bowed again before the residing deity before pulling the ignition of my car. 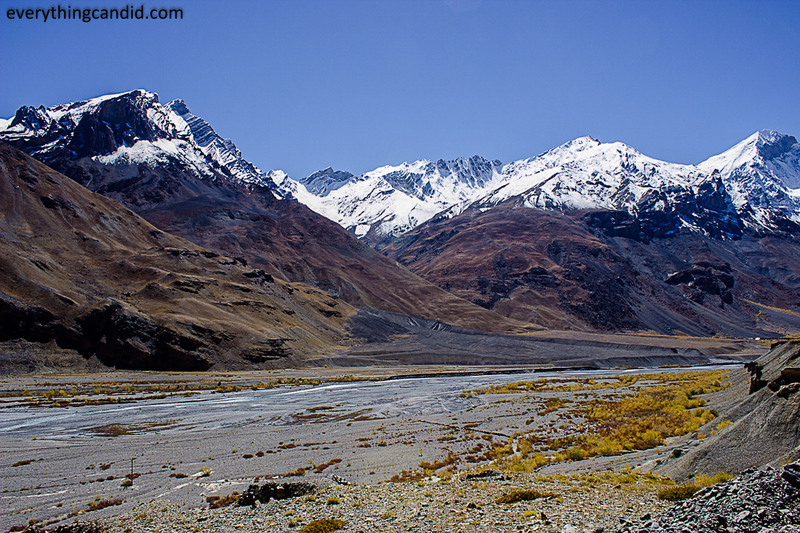 This can be reached only by road triping either from Manali/Keylong side or from Kaza Side. 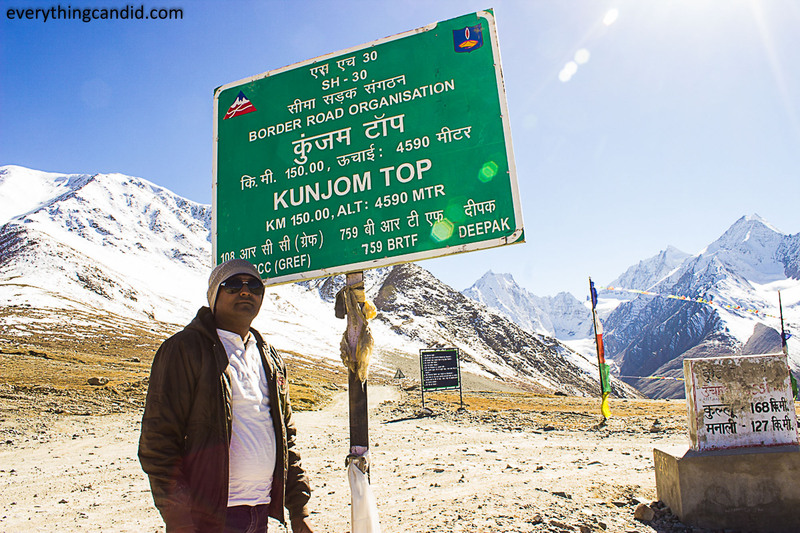 From Manali/Keylong: Both routes from Manali and Keylong merge at Gramphu which is 60 KM from Kunzum. 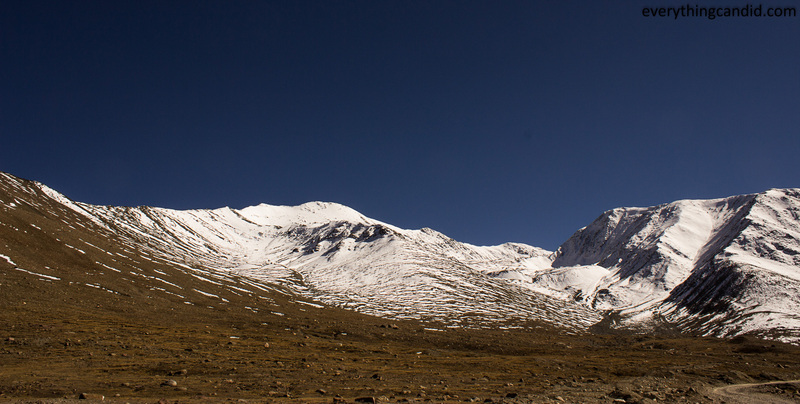 Manali to Kunzum is 130 KM and Keylong to Kunzuum is 110KM. 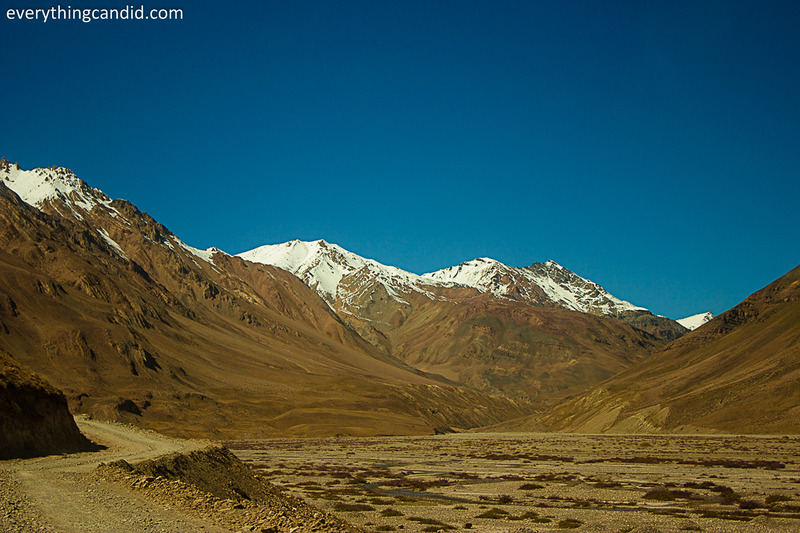 From Kaza Side: 70 KM drive from Kaza mostly along Spiti river takes you to Kunzum Pass. I could not stick the coin! My guide could do it for everyone! What a trip and such beautiful pictures. Doesnt matter….. You are still awesome and an inspiration for many like us. Thanks for the kind words of appreciation. Yes i had a great time. Thanks for dropping by. It’s nice to read about religions getting on as opposed to being at war with each other. Hope you had a good soundtrack for the roadtrip! Photos are spectacular. Thanks for appreciation. Yes i have an awessome playlist for my road tripping. Haha. I can see why they would close the road 7-8 months out of the year, but having to walk it by foot that’s crazy. The scenery is breathtaking, and I love all the flags. Hey Carmen, People do cross over it on foot and tehy are doing it for centuries. Thanks for liking. Wow what stunning landscapes! I am not sure I would have had the courage to make that trip in a hatchback! Thanks Rob for dropping by and for nice words. It looks difficult but its doable in hatchback. Ha ha… i am sure you would make it. Stunning landscapes. I feel like it is an awesome drive. I always love seeing places like this one. Thanks Karla. Its indeed stunning and serene.glad that u liked it. C u more often. Stunning photos as always. You keep showing me a side of India I had never seen. 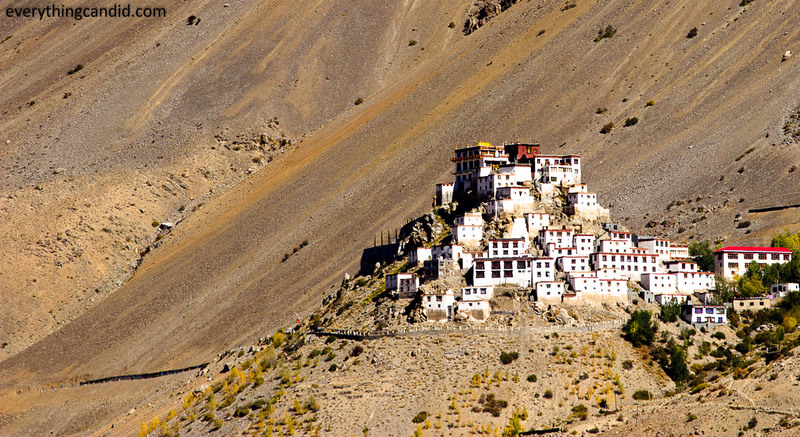 This Rey Monastery is so cute and beautiful. A pass that is closed 7-8 months, must be so special to be on it! Thanks Mar…. u always shower words of appreciation and this keeps me going. Mind Blowwwwwwwwwing! 🙂 Just can’t imagine what a wonderful road trip it had been! A “a self-elevating experience” indeed. Thanks Moon. It indeed was the best road trip ever. Gorgeus photos! I love seeing this side of India that I never really see in most blogs or even movies. Thanks…… I love such off beat and less explored places. Thanks again for wow words. Beautiful place! It sounds pretty easily accessible, too. Thanks for inspiring! 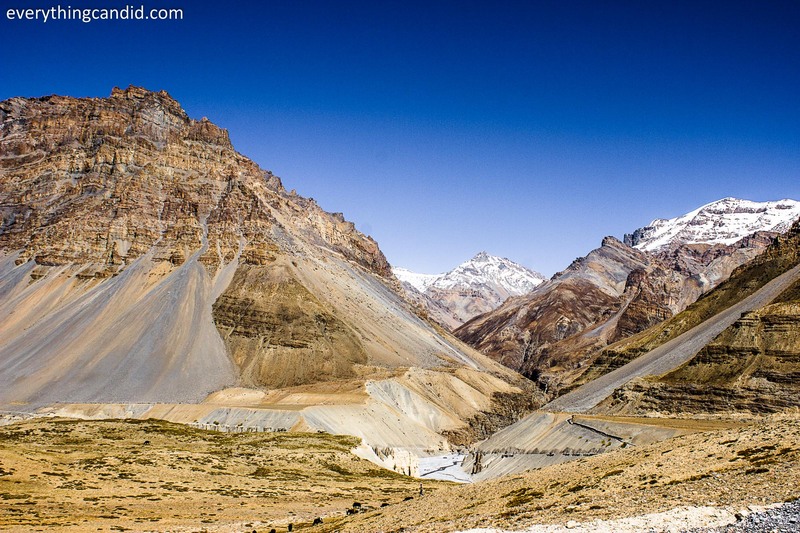 Your post and gorgeous photos unveil to me a side of India very few people talk about. It’s the beauty of the less beaten path, where the culture is still untouched by the modern civilization. Thank you for sharing this post. This looks absolutely breathtaking!!! I really love the shots you took as well since it perfectly captured the place. Thanks for introducing this, I’m taking note of it! Thanks…. i am so glad that you like them and feeling inspired to visit. The pictures alone would have told the tale. What an incredible landscape. Your photos are certainly selling this to me! It all looks so vast yet beautiful. So pleased to have read this. Never knew much about this area before. Thanks. Its great to know that it could inspire you. What a trip! Truly beautiful photos. Think this might be a little bit too intrepid for me! Thanks. Dnt wory, Once you there you will feel good. looks like a very cool journey.. skys look gorgeous and the flags are soo cool. 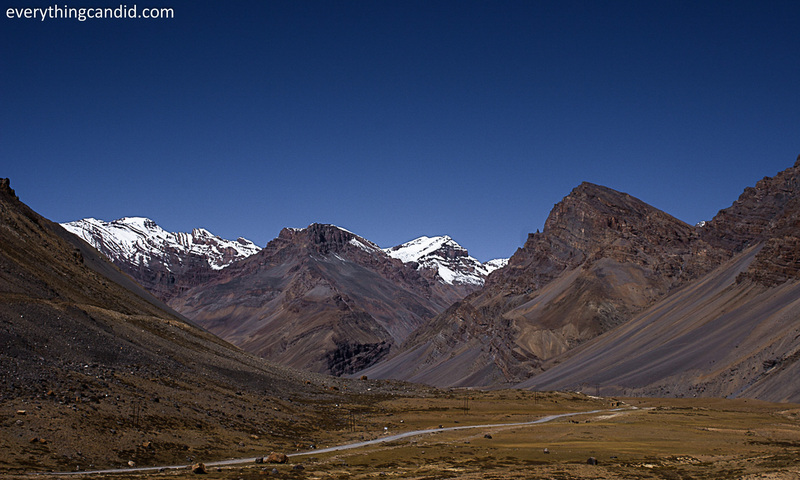 Bravo to your little red Ford hatchback to take you up through that pass, 4590 metres is such a long way up for a car to keep running with lower oxygen. Your pictures are absolutely breathtaking. You captured the vastness of it so well. How much more it would be like in person. The picture which was 2 pictures after your little red car, is incredible. The drop offs on the road with no guardrails whatsoever. Certainly would not want to meet another car there. Just AMAZING!!! Good to c u after a long time. Indeed Figo did a splendid job. I am glad that you liked the pictures. Good to have found another road tripper. Thanks, I’ll be sure to do that! 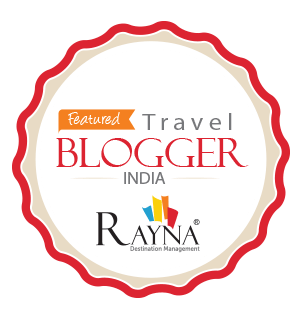 It seems like India can offer anything to its travelers! So true. 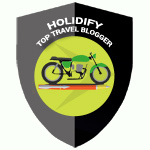 It has all weather all terrain travel destination!! 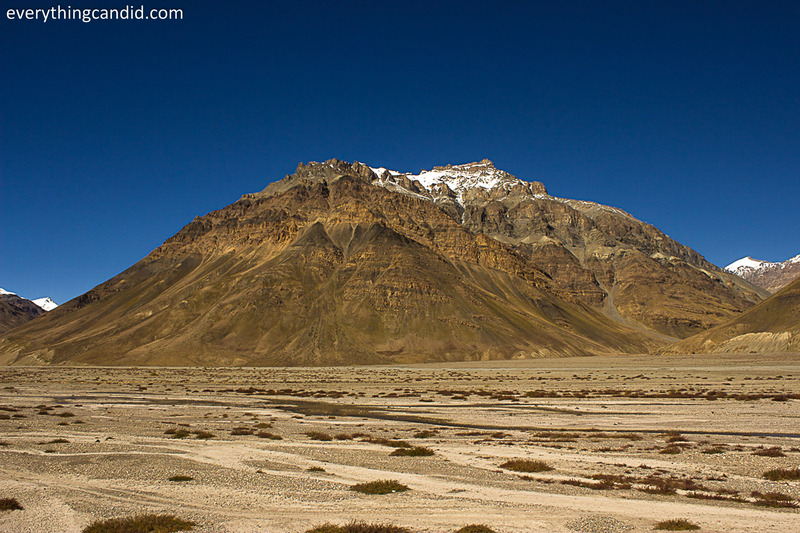 I narrowly missed out on a volunteer opportunity in Spiti earlier this year. I’ve been wanting to explore the area for a bit. Great pictures here, Himanshu. Glad you had a lot of fun. Thanks Sanket. Which volunteer organization did you plan to work with? WOudl love to know. Ah lovely! What was the temperature like? Thanks. At kunzum day time was pleasant but with chilling breeze. Night is sub zero. Here from the Travel Blogged thread. These photographs are truly majestic. What camera are you using? Thanks for dropping by and commenting. I use basic DSLR Canon 600D. 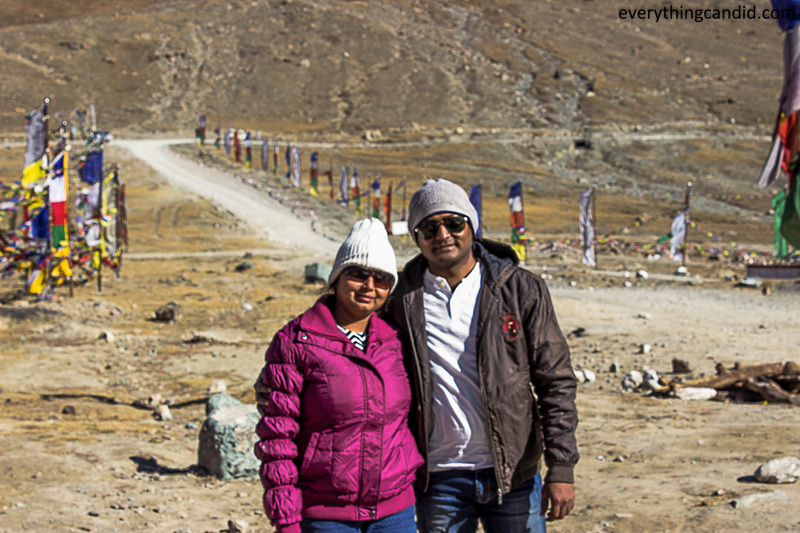 It was indeed an awesome experience at Kunzum Top. Thansk for your kind words. Sounds like a great trip. Thanks for sharing Must go there soon! Wow and you did it in a small hatchback! Looks like a great trip to do. I am inspired to go in 2016. Any takers? Thanks Bharat. You must go there. For any support do let me know. And i ahev received your mail but due to diwali festive season. Could nt get time to plan and revert. But certainly we would work out. Will connect over mail on that. Great photos… I don’t follow from where to where you went… kaza pass connects from one valley to Spiti… and the brown dry landscape along with changes in few places with new capped mountains somewhere… well it was nice to know about the tolerance or merger of Hinduism with Buddhism here…pretty cool!! Haha…. 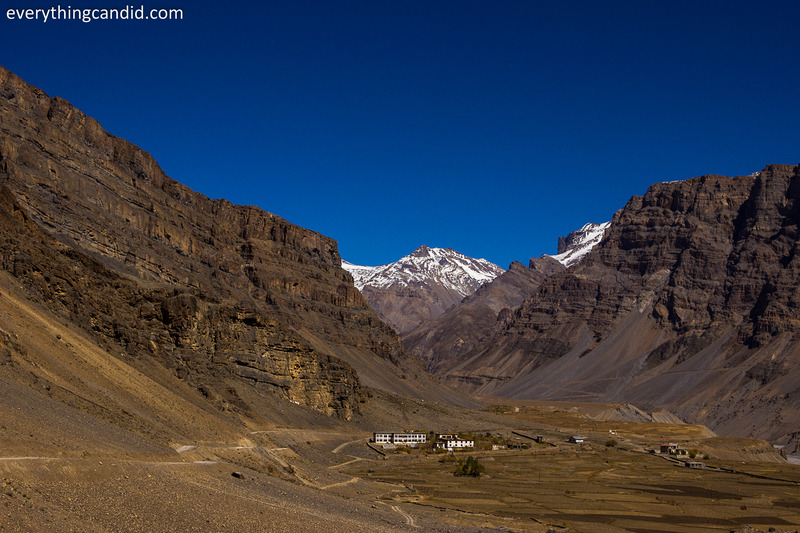 you may have to read other post on my spiti tour to understand where all i visited. 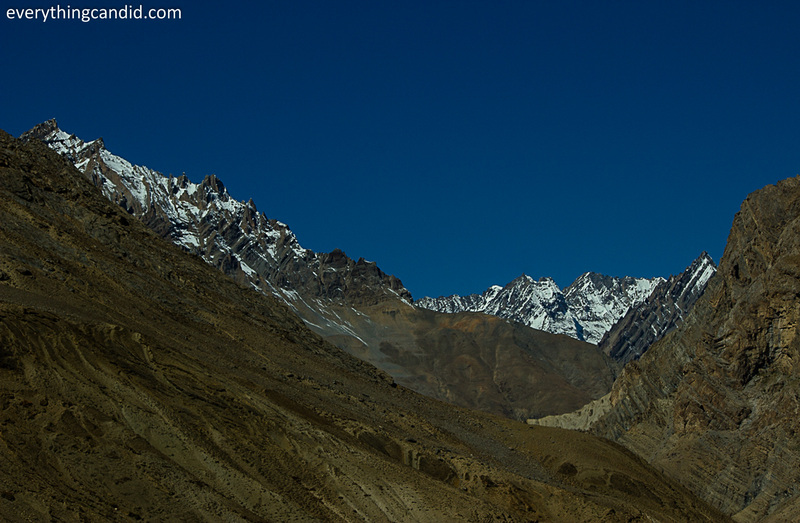 This plae in Himalaya is really amazing place. and offers different kind of experience. That road trip certainly looks like quite the adventure! I’m sure that having a reliable vehicle is the top priority, as I doubt there is a service station anywhere in sight! Great pics. Thx for sharing. Thanks Man. Lets engage more often! 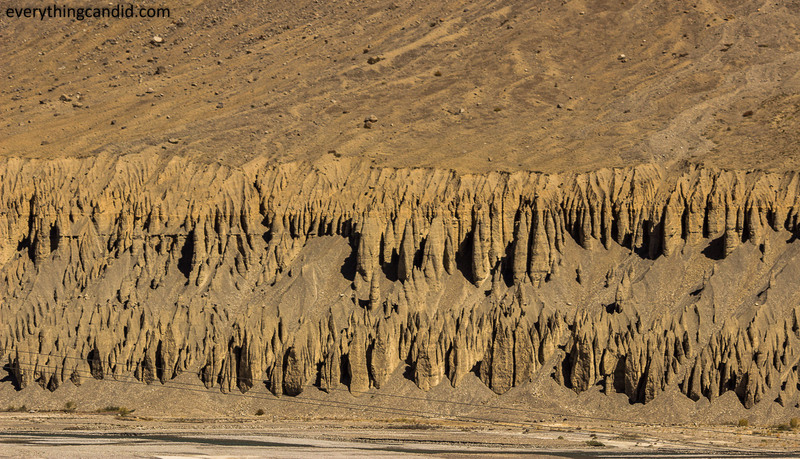 This is an amazing route to go through…I have to go there some day! Absolutely Alok. This is one of the most and incredible place to visit in lifetime. Thanks for your appreciation. Beautiful pictures. I am planning this june to do the same circuit. I am thinking of doing it in a Hyundai Grand i10, Ground clearance is 165mm whereas figo is 170mm. 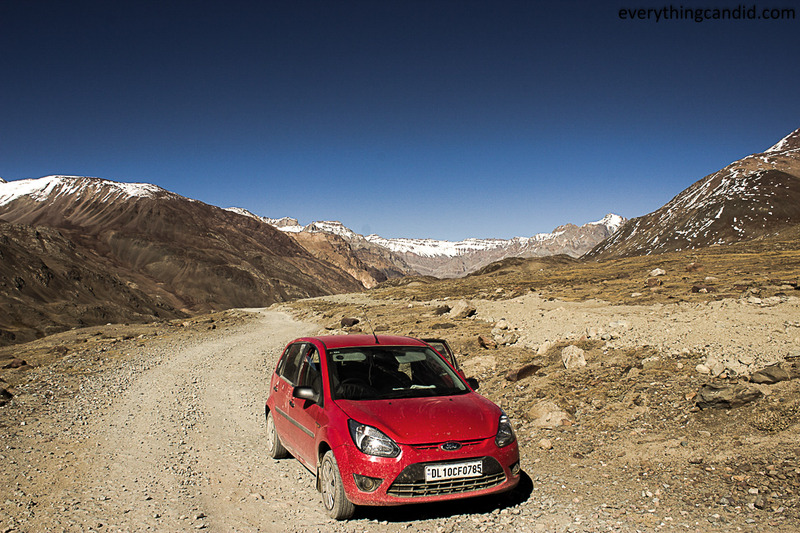 Did you anywhere phase any difficulty in taking figo throughout the trip? Is it easy for hatchbacks? You will facee some issue near Batal-Chhatru if plan in June as melting water overflows and that hides everything. Plan for September or early October as by then flow of melting water will be less and easily you could drive through rough patches. I didnt phase any problem as i did it in September last week. 1) Did your car get any underbelly hits? 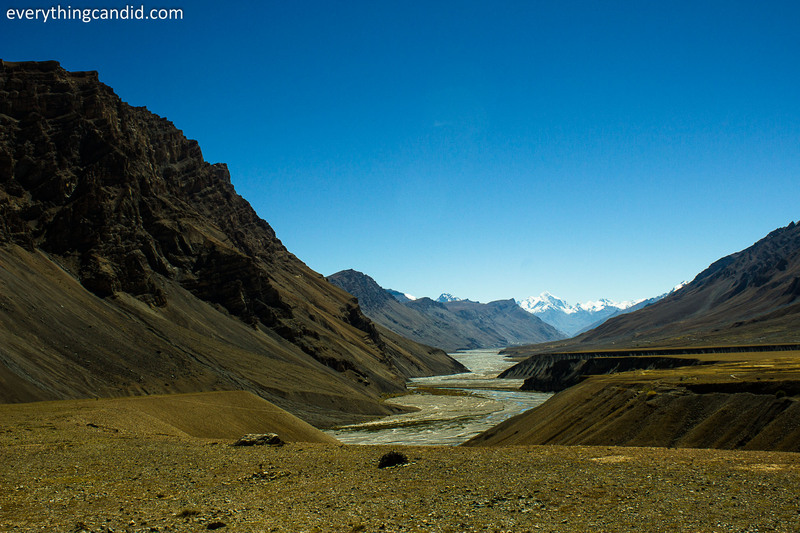 2) Did you visit Chandratal lake too? 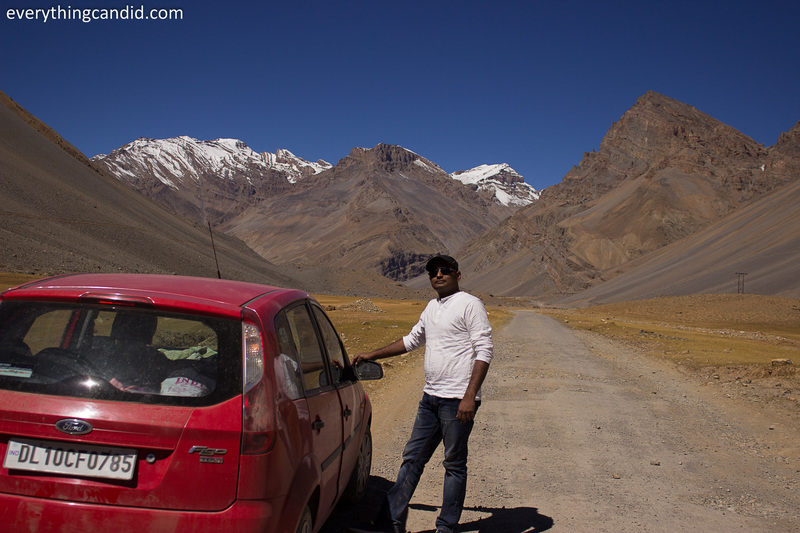 3) Now I have planned to hire a self drive figo with 3 people on board. Apart from the water nallas crossing the road(Which we will somehow manage to cross), Will the Figo manage to escape without getting underbelly hits and undamaged bumpers? 1. Yes i had few underbelly hits but fortunately nothing serious. 3. I cannot answer this directly. But my suggestion would be to have highest level of patience and you would certainly make it. Whenever you are in doubt, ask your team member to go down and guide you. I believe it is doable. However, will again suggest you to go in September 🙂 with Figo.